Steam irons are your best helper when it comes to keeping your clothes crisp for that confident look when you step out of the house. The shots of steam from the iron help smooth the creases on your clothes. What’s more, most steam irons now come with safety features like the automatic shut-off system to prevent fire hazards during ironing. There are so many steam irons available on the market, so what should you be looking for when you read steam iron reviews 2019? Well, we are here to help you with this article which has included steam iron reviews of our top 5 best steam irons. However, before we dive straight into that, you should first consider what type of steam iron you need. What Type of Steam Iron Should I Buy? What Steam Iron Features Should I Look Out For? Today, we have the choice of the traditional steam iron or the fancier steam generator iron. The traditional steam iron which uses a combination of steam and heat to give your clothes that crisp and pressed finish. The steam generator iron typically has more steam power than the regular steam iron— it comes with a separate water tank. This makes the iron lighter and allows it to steam for a longer period of time without requiring a refill. For all these benefits, the steam generator iron has its flip side as well. It tends to be bigger, heavier and more expensive than the regular steam iron. If you are on a budget, we think that the traditional steam iron should serve you well. Many of the traditional steam irons these days aren’t too far behind the steam generator irons in terms of steam power and other modern safety features. 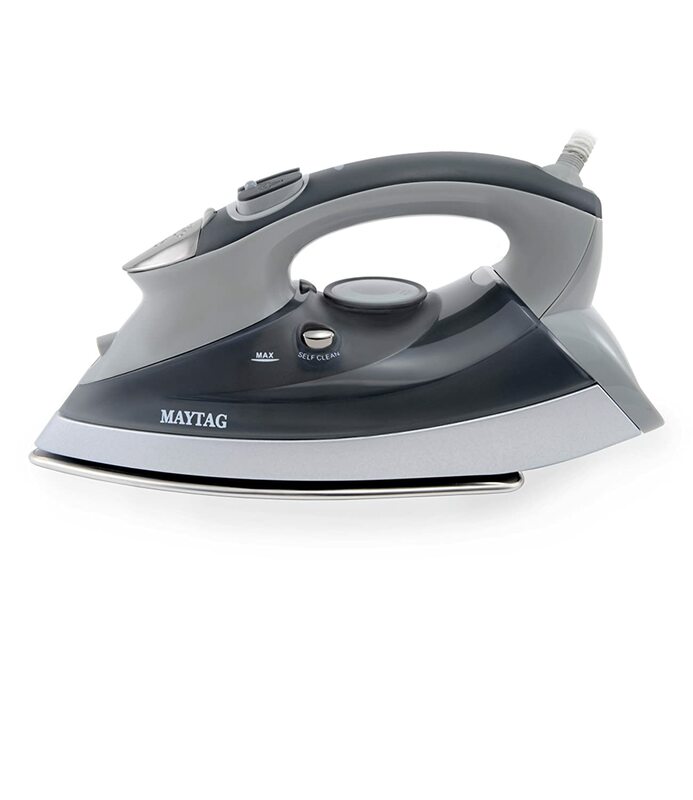 In fact, we have included steam iron reviews on traditional steam irons that have made it to our top 5 best steam irons 2019. The best iron handles are those that you can hold comfortably even after you have been ironing for quite some time. Comfortable iron handles are typically softer or easier to grip. The handles should not be too wide for your grip either. A steam iron that has a thin and tapered soleplate makes it more convenient to reach the slide under buttons and into tight pleats. Such steam irons are also scratch-resistant, so you won’t be bothered by troublesome zips when ironing your clothes. If the soleplates are chunky, they tend to catch onto buttons and zips, which makes for a bad ironing experience with many interruptions. If you live in a hard water area, it’s best to get a steam iron with limescale resistance / a limescale filter so that the performance of your steam iron will not be hampered by the accumulation limescale over time. The list of ideal features for the best steam iron can go on and on. Some other ideal features that we have noted from our steam iron reviews 2019 include easy-to-fill water tanks, visible water levels and a sufficiently long power cord for ease of access to power. While it is unlikely that a single steam iron will be able to fulfill all your dream requirements, it is still important to consider your priorities before reading our steam iron reviews 2019, so that you have a better idea of what you are looking for. At very affordable price for an 8.5-inch 1500-watt model, the Shark GI305 is a great steal. Most of the customers loved their purchase. What’s more, there are customers who have remained loyal to the Shark GI305 and swear by this steam iron’s durability over the years. Its built-tough stainless steel soleplate is very easy to maintain— it does not rust or turn dull. Other features include its Smooth Glide technology for a smooth ironing experience, an anti-drip function and an auto shut-off feature with multiple positions for ease of access. This steam iron also comes with a one year warranty. For even the small budget, you can get a decent steam iron that will help you get the job done when it comes to keeping your garments crisp and pressed. Indeed, this is a deal that you definitely shouldn’t miss out on, especially if you have a tight budget and you are looking for the best steam iron for your budget. If you’re the careless or the forgetful sort, or if you are a parent with young children who are always running around the house, the Black & Decker D2030 is the perfect candidate as a steam iron with excellent safety features. Many customers could not stop raving about— its three-way auto shut-off feature purportedly gives its user peace of mind with every use. The auto shut-off feature is motion-sensor based, so the steam iron switches off after 8 minutes of idle sitting on the heel and 30 seconds when its soleplate or sides are faced down. Other fascinating features include its auto clean system, press-button mister that provides the right moisture amount for quick and smooth ironing and anti-drip function that prevents water from leaving the soleplate when the temperature is too low. Many steam iron reviews about the D2030 also remarked that the handle really lives up to its claim of being comfortable during use. Although the Black & Decker D2030 is about twice the price of the Shark GI305 for the same one-year warranty, I must say that it is well worth the price premium for its more advanced features, especially in terms of its safety settings. If you’re the kind of person who needs to bring your own iron during business or even personal trips, you should consider getting a cordless iron to save yourself the hassle of bringing a bulky iron with a long power cord. After ploughing through the many glowing steam iron reviews 2019 of the Panasonic NI-L70SR, we think that this steam iron might just fit the bill for frequent travellers. At just 5lbs, this cordless steam iron is pretty lightweight and its compact design makes it a portable travel companion. This steam iron has its own charging base with a retractable cord for easy storage, a removable water tank so that the user won’t end up spilling water all over it, as well as a vertical steam function to remove wrinkles of hanging garments effectively. It also has an auto shut-off feature which kicks in if the iron has been left on its power base for more than 10 minutes. The Panasonic NI-L70SR comes with a one year warranty. 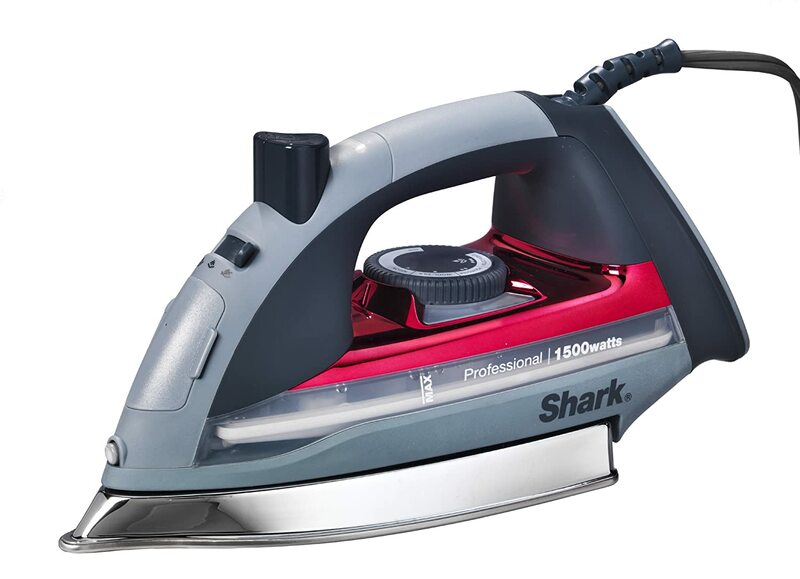 Based on the steam iron reviews 2019 of this product, it seems that this handy helper is pretty durable and many customers have said that the Panasonic NI-L70SR lasted beyond its warranty period. That said, for all its convenient features, this steam iron does not come cheap. Nevertheless, we are convinced that this is one of the best steam irons out there if you want a portable, lightweight steam iron that still packs a punch when it comes to keeping your clothes crisp and pressed even during your travels. After all, you may not always have the good fortune of having a working iron in the hotel or your Airbnb lodging. If you buy home appliances frequently, you should be no stranger to the Rowenta brand. 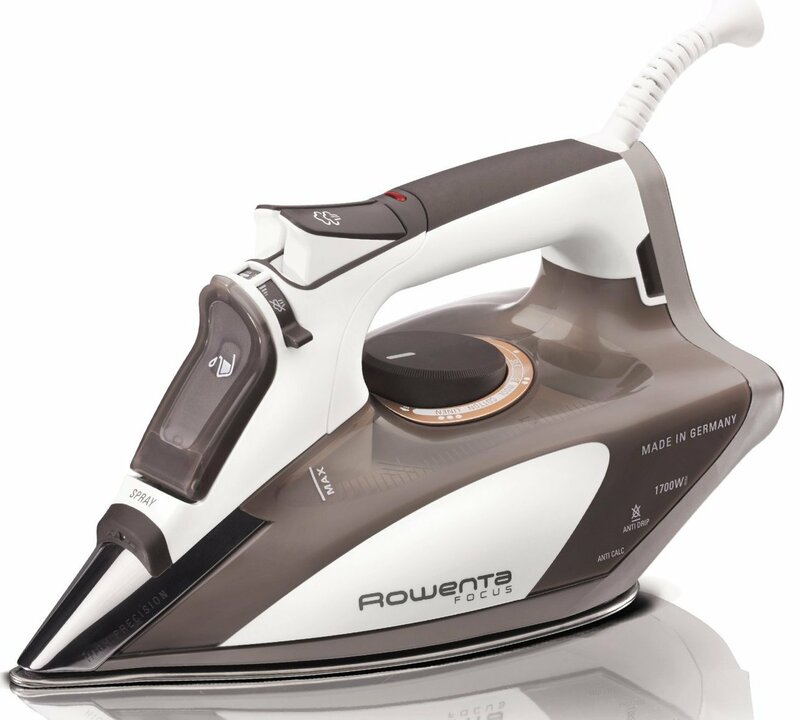 The Rowenta DW5080 offers the best steam iron for your steam ironing experience. Its patented Microsteam 400-hole design enables the steam iron to provide thorough and even steam distribution during ironing. This steam iron is quick heat-up speed and precision tip that helps the user target areas that may otherwise be hard-to-reach. 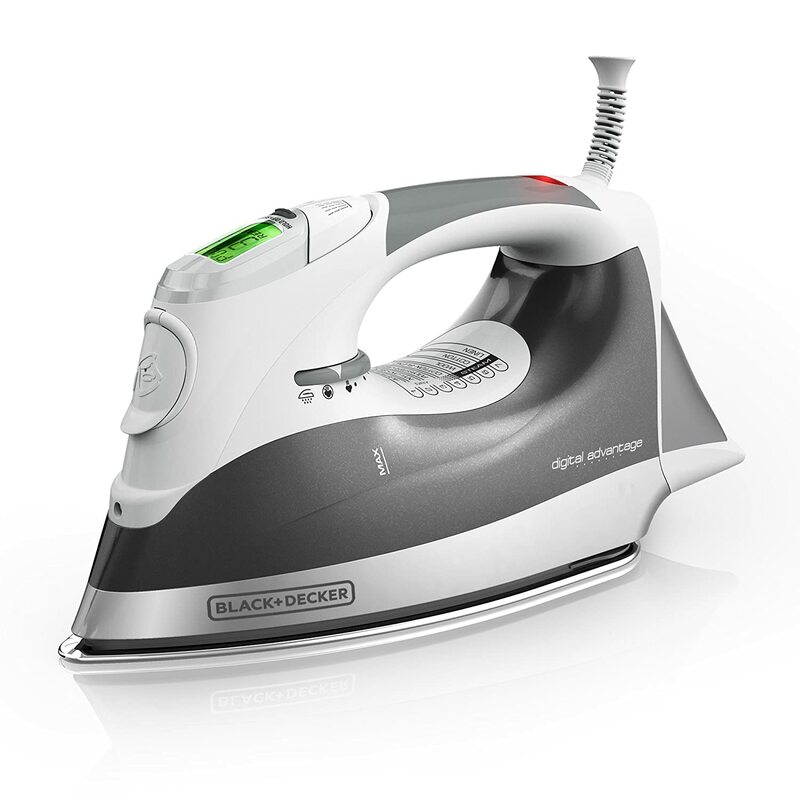 Besides its three-way auto shut-off feature, self-cleaning system and vertical steam feature, this steam iron also comes with other impressive features like an anti-calcium system, a visible level indicator for its water tank, and its capability to produce a powerful shot of steam at 100g per minute. The Rowenta DW5080 comes with a one year warranty. Steam iron reviews 2019 of this product point have also revealed other awesome features like its power cord length—the Rowenta DW5080 comes with a power cord that is about 2 to 3 inches longer than many typical corded steam irons. If you’re always in a rush and you want an iron that can get the job done quickly and effectively, the Maytag M400 is a steam iron that you should definitely consider. After all, the product’s full name says it all – speed heat iron. This product is quick and constant heating up, and the maximum heat can be achieved within a span of less than 55 seconds. This iron is also capable of regenerating the steam burst in 3 seconds. All these mean that the Maytag M400 takes literally no time to heat up and generate constant bursts of steam, in fact probably less than the time it takes for you to get your garments ready and aligned on the ironing board. What’s more, this steam iron is also equipped with other good-to-have features like an anti-calcium system and an anti-drip self-cleaning system. Unlike the above steam irons, it also comes with a longer warranty— two years to be exact. With the Maytag M400, ironing might become your favourite household chore in no time! So, there you have it—our top 5 best steam iron picks based on the latest steam iron reviews 2019. Be sure to check out our buying guide here before you get overwhelmed by the countless steam iron choices that are available. It is always a good idea to go through and list down your criteria and requirements when it comes to any purchase (not just steam irons) before diving into the stores or websites. That way you will be able to reduce the chances of an impulse buy that you may come to regret later. Our buying guide here is aimed at providing you with a succinct and comprehensive summary of our take on the best steam irons 2019. Ultimately, you are the best judge when it comes to your own needs. Besides, it is always good to check out the most recent steam iron reviews to see if there may have been any changes in the quality of the product in the latest batches that have been sold. You may find treasure troves or good advice in the included steam iron reviews here. Other than steam irons, you should also check out our product recommendations for other items if you are interested in buying other household appliances. Wheelbarrows, vacuum cleaners, chainsaws, etc. These are just some of the many items that we provide product recommendations and reviews on our website. Happy reading and happy shopping everyone!